Do You Like Aromatherapy Candles? I am always drawn to them in stores. I have to smell them all. But whenever I fall in love with one, purchase it and bring it home, I am disappointed in two ways. First, it seems the aroma doesn’t really spread out into the room when I light the candle. The scent is in the wax but the flame doesn’t release it. I find I never have a pleasant aromatherapy experience with an “aromatherapy” candle. The second disappointment is that after a time, the aroma of the candle itself starts to bother me. Often it brings on a headache. What seemed to be a light and pretty aroma in the store reveals itself to be unpleasant and annoying after repeated exposure. This is because of the chemicals in the oils used to make the candle. And you and I know that if you’re not using pure essential oils, you’re not diffusing and inhaling something that is good for you. Well, you could make your own aromatherapy candle if you have the time. I don’t have the time. So I came up with a better idea! 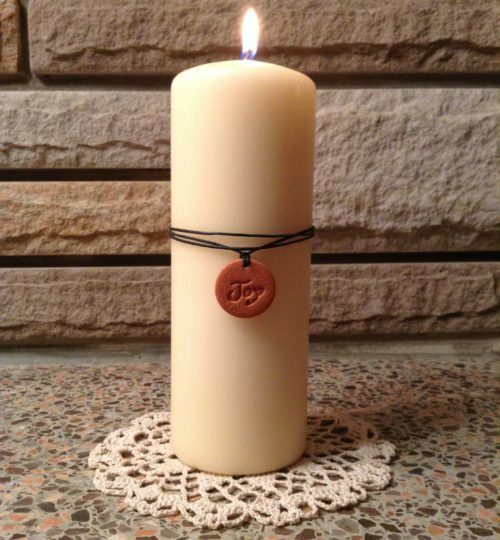 I lengthened the cord of a Terra Cotta Pendant to its maximum length, cut off the knots and tied the cord around a large unscented pillar candle. Now I can put whatever essential oil I want on the clay, I can change the essential oil daily if I like, and when the candle burns down to nothing, I can tie the pendant to a new one. This works well because when you light the candle it creates a vertical air movement with the hot air rising. The essential oils flash off the pendant and get caught in that upward current and circulate in the room. The beauty of this is that the aroma diffuses into the space without any undue heat applied directly to the essential oils. #1 It actually does diffuse into the room #2 No chemical headaches. #3 The aroma is therapeutic (assuming you’re using top quality essential oils). No disappointment, no mess, no time-consuming candle-making process, just an effective diffuser paired with an atmosphere-creating candle. A beautiful aromatherapy experience created in less than a minute. With 89 (and counting) different Terra Cotta Pendant designs to choose from, options abound! 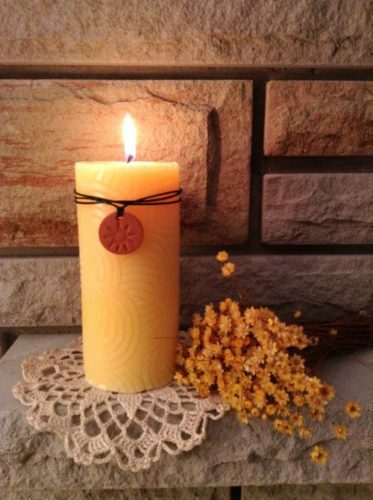 Tie each of the five elements designs to their own candle. Tie two or three pendants to one tall pillar candle and create your own blend by using different essential oils on each pendant. Get creative with green pillars tied with leaf designs. 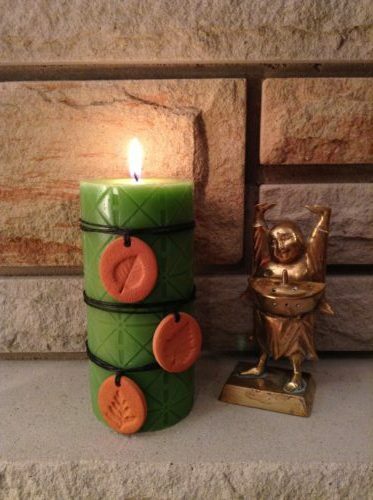 Make some funky Rune aromatherapy candles. 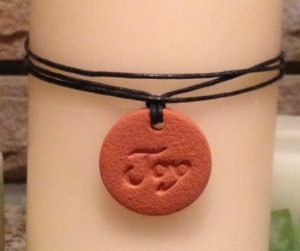 Tie the Om pendant to a candle to diffuse during your yoga practice. Tie several hearts on a red candle for Valentines Day – or any day! Will you use jute for a rustic look or ribbon or lace for a softer one? How will you run with this idea and create beautiful therapeutic aromatherapy candles for your home (and for people on your gift list)? Here is some more inspiration! 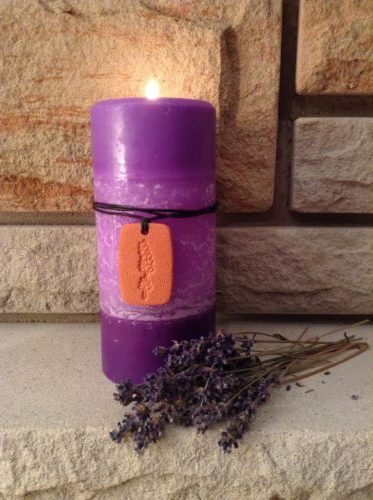 Create a Lavender Aromatherapy candle with a few drops of Lavender on the Lavender pendant! Three Pendants, three essential oils! Craft your own signature woodsy fragrance blend! Sunshine pendant on a sunny yellow pillar. What essential oils will you diffuse?